Davido wins BET Best International Act Award 2018 – Royal Times of Nigeria. 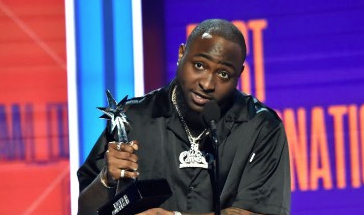 Nigerian singer, Davido has won the Best International Act at the 2018 BET Award which held at Microsoft Theater in Los Angeles, California. The pop singer won the award yesterday in the process beating fellow nominees, Tiwa Savage also from Nigeria, Booba (France), Cassper Nyovest (South Africa), Dadju (France), Distruction Boyz (South Africa), Fally Ipupa (DR Congo), J Hus(UK), Niska (France), Stefflon Don (UK) and Stormzy. It was the first time any Nigerian will receive the BET award on the main stage, with hundreds of celebrity audience cheering. Davido used the opportunity to pay condolences to fellow artiste; D’Banj, who lost his son on Sunday, and he also urged more foreign stars to collaborate with Nigerians/Africans, calling out names like J.Cole and Migos.